Alrighty people. My life just got so hectic. This whole 8 to 5 thing is so overrated. I do not know how you all do it. Every day. Wow. Fortunately I only have 3 more weeks left and then I’ll be back to being on sabbatical. (This is what I am now terming my current state of unemployment.) Phew. So, because of the unseasonable busyness of the last week (it’s been one week and already I’m complaining – clearly real jobs are just not for me) I haven’t really had time to bake up a storm. Yes, I did experiment with the caramel cinnamon sticky buns but there hasn’t really been much else. But, as most of you are probably aware, yesterday was Father’s Day. That day of spending time with our dads. Yup, mine entails feeding him. Easy. Simple. Until it gets to Saturday night and you realise you haven’t thought about a dessert (genuinely) and there is no butter in the house and you’re on a Monday deadline and must spend every available minute not cooking, working. Panic. Never fear dear readers. Help is at hand, in the form of this recipe. 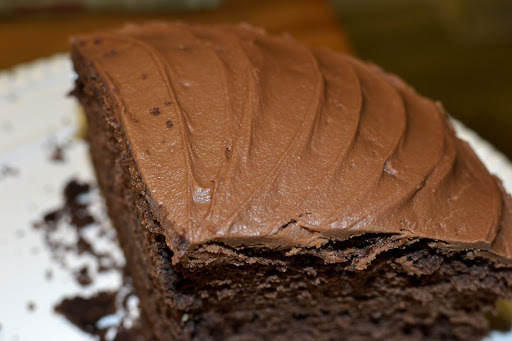 It’s another family classic and is conveniently my dad’s chocolate cake of choice. Happy day. 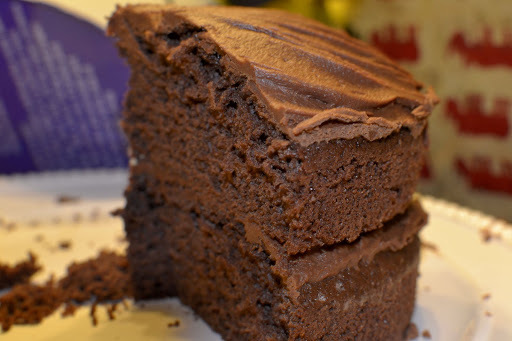 It doesn’t need chocolate or butter, being a recipe from a time when such things were considered extravagant, it uses cocoa powder and oil. It’s basically everything you would have in your pantry at any given time. Well, okay, everything I would have in my pantry at any given time. And it’s easy. It’s the cake I learned to bake first, when I was rather young. So you can totally do it. I am not giving icing today because I had an incident of failure with the icing yesterday and cannot under any circumstances reveal what I did to make it edible. Never. But this cake is lovely filled with chocolate mousse and drizzled with ganache. I also like it plain, served warm with custard, but that’s just my custard thing talking. Ordinary butter icing would work well too or whipped cream and bar-one pieces… I leave it to your good judgement. First thing is to preheat your oven to 180C. Grease 2 20cm round cake tins and line the bases with baking parchment. 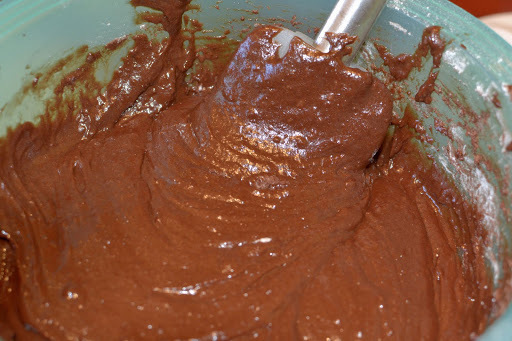 Mix the cocoa powder with the boiling water, whisking to get rid of lumps then set aside. Mix together the egg yolks, vanilla and oil. In a separate bowl weigh the dry ingredients. Mix the cold water into the cocoa powder, then whisk the cocoa powder into the egg yolk mixture and pour this into the dry ingredients. Carefully mix everything together. It will be fairly stiff at this stage. Finally, fold in the whites in 2 stages. Fold about 1/4 in and roughly mix this into the batter. Then lightly fold in the rest. Pour the mixture into the lined cake tins and bake for 20-30 minutes until the cakes spring back when touched and a skewer inserted comes out clean.